Lucifer defied our Father, and he betrayed me, but still, I don't want this any more than you would want to kill Sam. You know, my brother... I practically raised him. I took care of him in a way most people could never understand, and I still love him. But I am going to kill him, because it is right, and I have to. God created Michael, the first archangel, the eldest of four brothers: Lucifer (whom he had a close bond with), Raphael and Gabriel. Michael, along with God and the rest of his fellow archangels would imprison the Darkness to maintain the Cosmic Balance. After the creation of Heaven, its angels, and Earth, God commanded all of the celestial beings to bow before mankind, asking them to love humans more than himself. Lucifer questioned this order, insisting that they are "flawed, murderous beings." Lucifer then sought out his older brother, Michael, for support, but Michael refused to listen. After Lucifer creates the first demon, Lilith, Michael would be the one to cast Lucifer out of Heaven allowing God to imprison him in the Cage. At some point, God left Heaven and Michael assumed command of the angels, running Heaven and Earth for a millennia. When demons began making plans to free Lucifer, Michael decided to allow the seals binding Lucifer to be broken. He and a group of other angels, including Raphael and Zachariah, wanted the Apocalypse to occur so that he and Lucifer could battle. Michael expected to be victorious, so as to bring about paradise. Lesser angels, like Castiel, were not privy to the plan, and were deployed to make it look as though Heaven was fighting Lucifer's release. When Lucifer was eventually freed, in order to confront him, Michael needed his true vessel, Dean Winchester. Zachariah was instructed to get Dean's permission to possess him. To Heaven's chagrin, Dean refused adamantly, and Michael was left to act through his agents. He then decided to speak with Dean in person, when the Winchester brothers were sent back to the year 1978, and used their father John Winchester as a temporary vessel. Over time, Dean's resolve weakened, and just as he prepared to give his consent, the angels resurrected his half-brother, Adam Milligan, for the purpose of fulfilling the task of being Michael's vessel. This was soon revealed to be a ploy to make Dean give in, but when Dean killed Zachariah, after Michael had been called down from Heaven it forced Michael to take over Adam's body. Michael then met with Lucifer, who inhabited Sam Winchester, on the chosen field. As Lucifer was beating Dean to death, Sam, at the last minute regained control over his body and flung himself into the Cage, pulling Michael along with him. While Sam was eventually rescued from the Cage and Lucifer eventually escaped, Michael remains trapped within. According to Lucifer, being trapped in the Cage has driven Michael insane and he is now curled in a ball "singing show tunes and... touching himself." God later tells the Winchesters that they cannot call upon Michael to aid them against the Darkness as he is in no shape for a fight. Michael sees himself as a good and loyal son to his father, and that matters most to him. He professes love for Lucifer, his younger brother, but insists that he is only serving his father by destroying his brother. He seems to think himself magnanimous when he promises to leave Dean whole and not catatonic, after serving as a vessel. His insistence that his actions only serve God is not entirely true, as he blames Lucifer for the loss of their father, and is angry with him. He also becomes furious with anyone who interferes with his destiny, including Anna Milton, Dean at Stull Cemetery, and again with Lucifer, when he suggests that they refuse to fight. Despite this, he considers abandoning his destiny for a moment when the latter suggests it. It is this stubborn insistence on fulfilling his story as written that leads him into imprisonment in the Cage. Apporting - Michael can banish angels with a snap of his fingers. Healing - Michael, like all angels, can heal any wounds or injuries. After being hit with a Molotov of holy oil, Michael was able to heal the injures sustained from contact with holy fire. Manifestation - He requires a vessel to walk the earth. Mental manipulation - Michael is capable of Erase specific memories from a person's mind, as he does with John and Mary. Resurrection - He can revive the deceased as he did with Sam. Sedation - He can render people unconscious. Super strength - It is presumed like Lucifer, he can over-power pagan gods and lesser angels with little or no effort. Telekinesis - He was able to close the door to the Green Room when Adam attempted to escape. Pyrokinesis - He can incinerate lesser angels by touching them, as he did with Anna. Terakinesis - Michael's mere presence in his true form can cause the earth to shake. Teleportation - He can teleport himself and groups of people. Time travel - He can travel through time and transport others, such as Sam and Dean, through time. Archangel blade - Wielded by another archangel, the blade can kill Michael. Enochian warding sigils - Michael is susceptible to Enochian warding. Holy fire - While holy fire can kill regular angels upon contact, it can only temporarily banish Michael. 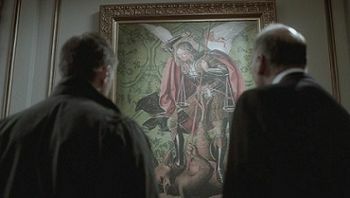 Sam notices a painting of Michael by killing Lucifer by the renaissance painter Raphael in the Church they visit. Father Reynolds: That's right. The archangel Michael, with the flaming sword. The fighter of demons, holy force against evil. Sam: So they're not really the Hallmark card version that everybody thinks? They're fierce, right? Vigilant? Father Reynolds: Well, I like to think of them as more loving than wrathful; but yes, a lot of Scripture paints angels as God's warriors. "An angel of the Lord appeared to them, the glory of the Lord shone down upon them, and they were terrified." Luke. Two nine. Zachariah talks to Dean about his destiny. Michael's name is never mentioned, but while Zachariah is informing Dean of his true purpose he is looking at an illustration of Michael in a painting in the Green Room. Upon Lucifer's rising from the Cage, Zachariah reveals to Dean that the angel's plan is for Michael to use Dean as his vessel and kill Lucifer once and for all. However, Dean needs to give his consent to be the vessel. Dean refuses and Zachariah tries to torture the consent out of him before a resurrected Castiel intervenes. Michael first manifests when Sam, Dean and Castiel have traveled back to 1978 to stop Anna Milton from killing John and Mary Winchester in order to prevent Sam’s birth, and thus his use as Lucifer’s vessel. Michael comes to John while Anna is attacking, and John consents when Michael says he can stop Anna from killing Mary. Michael incinerates Anna with a touch, and banishes Uriel back to Heaven, and sends Mary to sleep. Alone with Dean, Michael explains that while Dean is his true vessel, he can use others from Dean's bloodline. Michael also tells Dean his view of the Apocalypse, and the need to have a final battle. Before departing, Michael insists that everything is pre-ordained, including the need for Dean to serve as a vessel. He says that Dean has no choice, that "free will is an illusion," and that is why he will eventually consent. He then heals Sam, and returns the brothers to the present. He removes all memories of the events of the day from Mary and John. Zachariah has been dismissed from his position and is drinking in a bar, awaiting his destruction, when Michael makes contact. The brilliance and sound of the archangel kills the bar patrons and Michael offers Zachariah a last chance to secure Dean as a vessel. Meanwhile, seeing no other way to defeat Lucifer and save the planet, Dean is prepared to consent to becoming Michael's vessel]] when it is discovered that his half-brother Adam Milligan has been resurrected. The angels hold Adam as bait, and Sam and Dean attempt to rescue him. 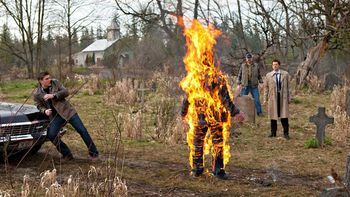 Zachariah tortures Sam and Adam in front of Dean, and Dean tells Zachariah he will consent on one condition. Zachariah utters an incantation that summons Michael to their location, Dean kills the distracted Zachariah with an angel blade. Sam and Dean manage to escape before Michael descends, but Adam is trapped inside the room and vanishes with Michael. Adam is technically a vessel, if only a temporary one, for Michael, being of the Winchester bloodline. Castiel tells Sam and Bobby that Michael is currently using Adam as his vessel. Michael burns in holy oil. After Lucifer joins with his true vessel, Sam, Michael appears in Stull Cemetery outside of Lawrence, Kansas, to confront Lucifer for the final battle. Lucifer tries to convince Michael that they need not fight, but Michael is adamant that he be a "good son" to their Father, and is determined to kill his brother. Before they can begin, however, Dean arrives and demands to speak to Sam. Michael protests his presence, telling him he no longer has a place on the field. But before he can do anything about it, Castiel hurls a holy oil molotov at the archangel, forcing him to vanish for several minutes. When Michael returns, Sam has managed to regain control of his body and has opened the gate to Lucifer's Cage. Michael demands a fight but Sam throws himself into the portal. Michael grabs hold of Sam to stop him from falling, but is dragged down into the pit along with him, the portal closing behind them. Subsequently, in Heaven, Raphael informs Castiel that he wants to release Lucifer and Michael so that the Apocalypse can be re-started. While talking with Dean, Castiel speculates that Lucifer and Michael are probably abusing Sam's soul, as they see their imprisonment as his fault, of which Balthazar makes a similar assumption. Dean explains to Death -- who already knows -- that Michael, still inside Adam Milligan, also fell into the Cage, and requests that the Horseman retrieves both Sam's soul and Adam's body. Death forces him to pick one, and Dean picks Sam, leaving Adam with Michael and Lucifer. In order to get Sam to say yes and become his vessel again, Lucifer takes Sam on a trip through his memories. One of these includes a stop at Stull Cemetery during the big fight with Michael. Later in the holding cell, Lucifer tells Sam he's the only hope left to stop the Darkness, as Raphael and Gabriel are both dead, God is MIA and Michael as it seems hasn't taken well to his confinement as, according to Lucifer, Michael is usually just "sitting in a corner singing show tunes and... touching himself." As God, Lucifer and the Winchesters formulate a plan to take the fight to Amara. God mentions that Michael is in no state to help them in the fight. Lucifer tells Crowley that being chained up in the cell he put him in was better that being sent back to the Cage with Michael, who is still drooling, insane ("not in the fun way"), and catatonic. Michael is the only angel to not appear in a vessel specifically introduced as the angel. 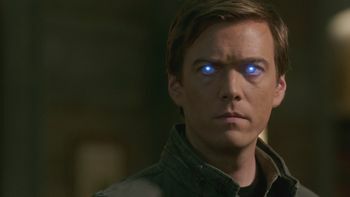 All other angels shown have appeared in vessels that were introduced specifically as the angel rather than the vessel; Castiel's vessel Jimmy Novak is the only vessel to be specifically named, and while Nick and Donnie Finnerman initially appeared as themselves, they were immediately selected as Lucifer and Raphael's vessels. 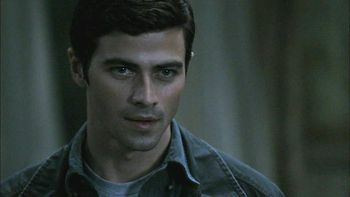 By contrast, Michael has only been shown when using John Winchester and Adam Milligan as vessels, both of whom had appeared before Michael was even introduced as a character. Michael is an archangel in Jewish, Christian, and Islamic tradition. He is most well known as a leader of the armies of God against Lucifer. When Zachariah tells Dean his destiny is to kill Lucifer he stands in front of a painting of the archangel Michael killing Lucifer. The painting is Saint Michel terrassant le Dragon by 15th century Flemish painter Josse Lieferinxe. The Feast of Saint Michael, or Michaelmas, is traditionally celebrated on September 29th. This is, coincidentally, the birthday of his alternate vessel, Adam Milligan. This page was last edited on 28 March 2019, at 08:13.